Call me a foodist, but I just cannot rationalize expensive Mexican food. You can dress it up, but an avocado is still an avocado. 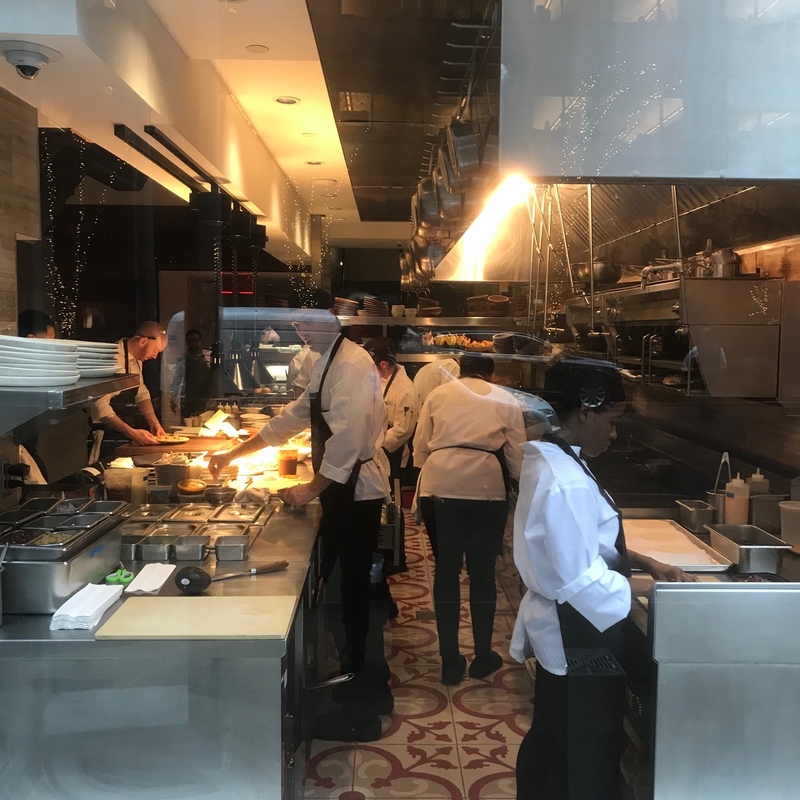 Empellon Midtown joins the realm of the absurd along with the noted NYC restaurant, Cosme…both being pricey and in my opinion, not worth it. 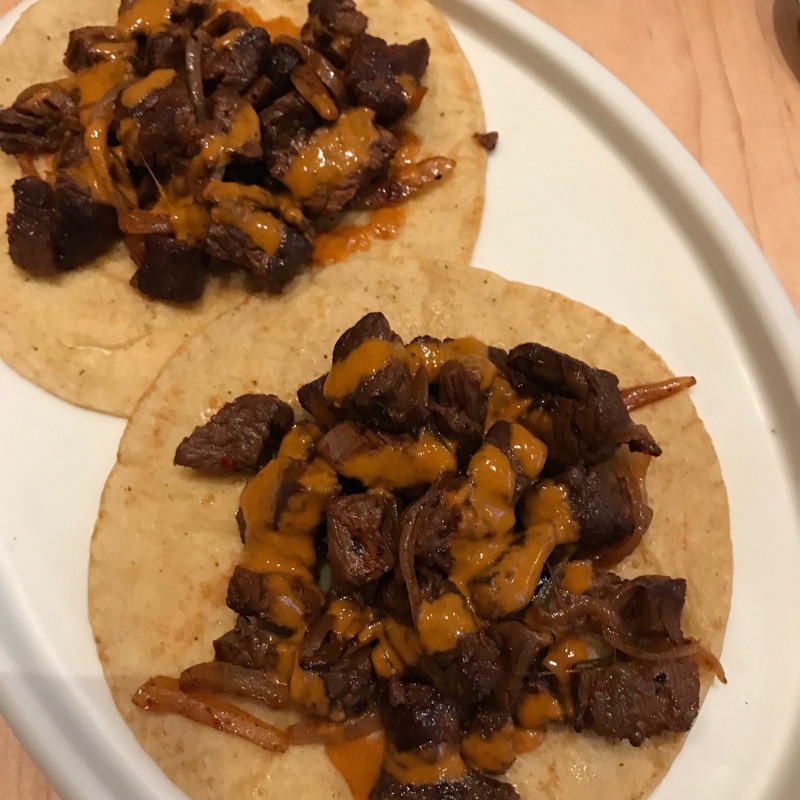 Recently, I dined at Empellon Midtown. I have broken tacos at other Empellons and the pricing was quite reasonable. I am sure the rent on East 53rd Street is very high, but come on. 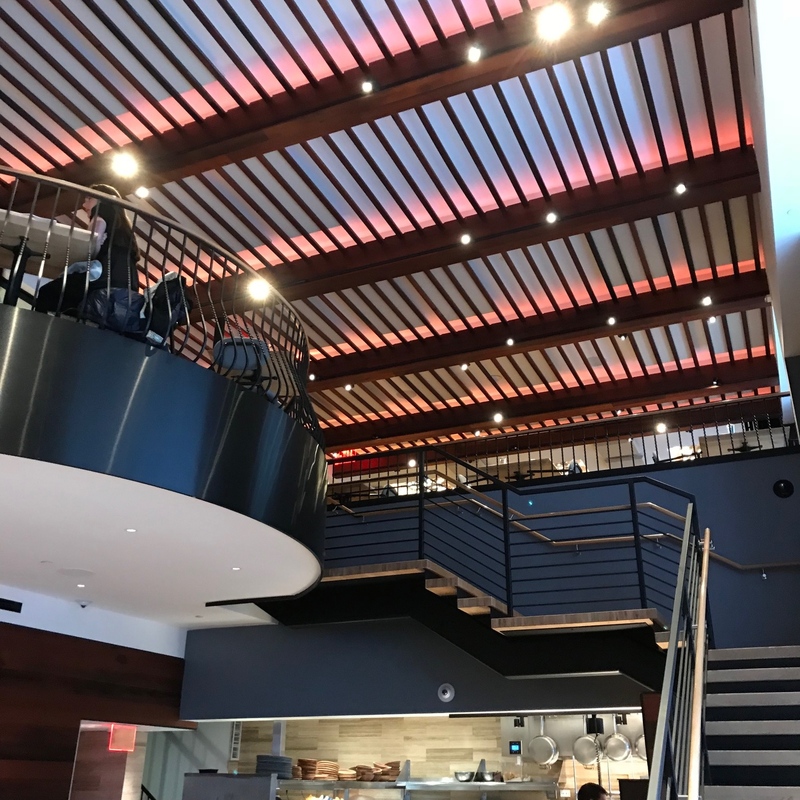 Empellon resides in an 8,000 square-foot, 150-seat, bi-level space. Chef Stupak opened his original Empellon restaurant in the West Village six years ago. 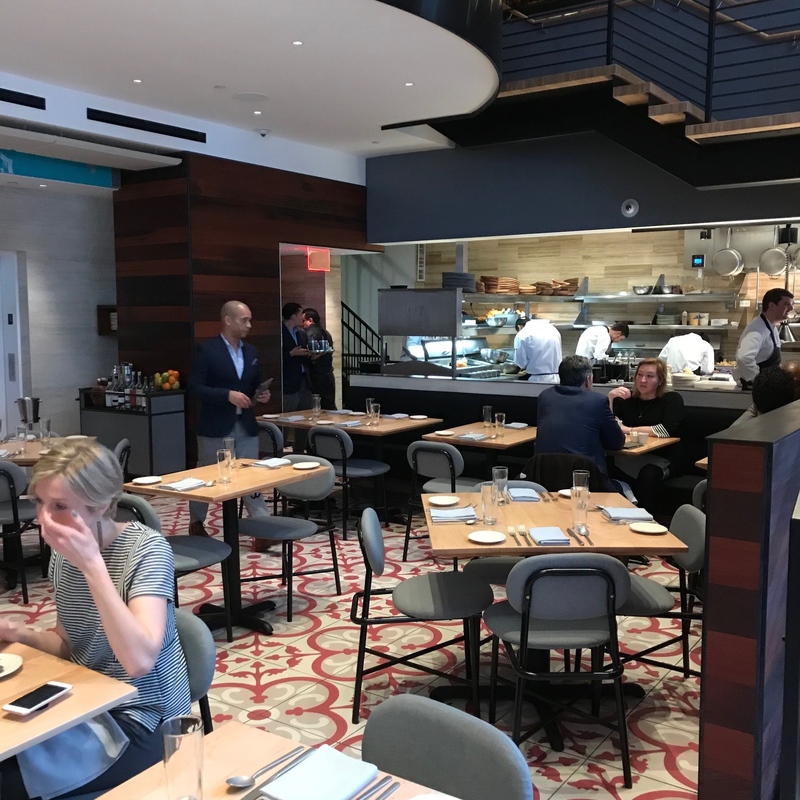 Empellon is very attractive as is the hostess who probably was hired to compliment the space not for her ability to rapidly and efficiently seat guests. This was my second foray and when empty tables are staring you down and you are left standing for 20 minutes with a reservation, there exists an obvious problem. Eventually, we were seated next to two dweeby, loud businessmen who compared their nannies looks, which numbnut attended the more prestigious boarding school, how much money they earned in their insulated hedge fund worlds…blah, blah, blah. The reason I include this bit of information is I overheard them place their order and when the food arrived they claimed the waiter erred. I call bull doodie and let the deflated server know the truth. Don’t arrogantly place blame on others when you are the idiot. 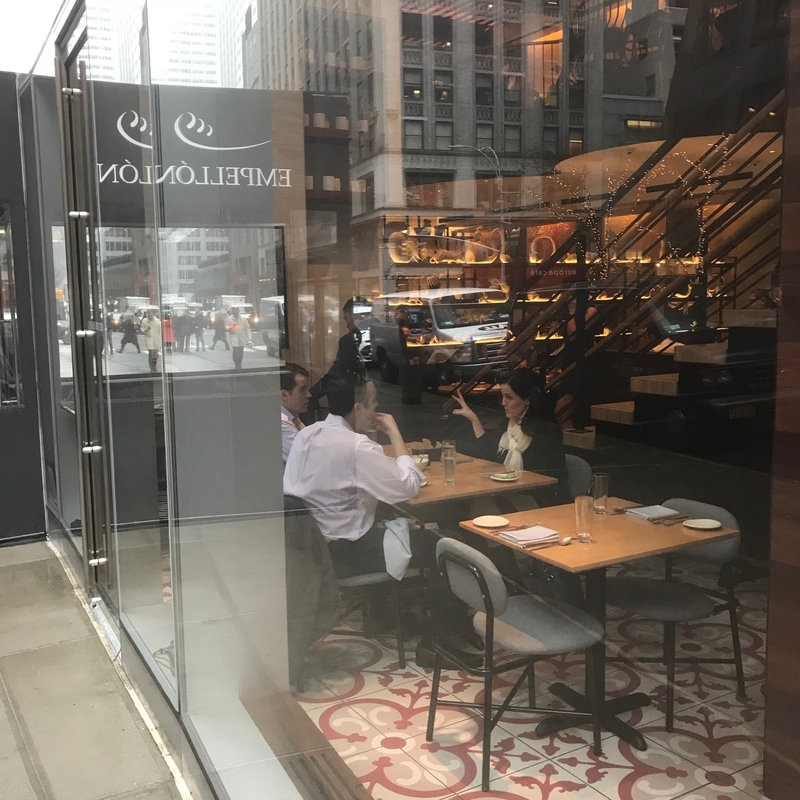 Empellon has a $38 prix fixe lunch (starter, 1 taco selection, dessert) and in hindsight that is the way to go at this overpriced joint. 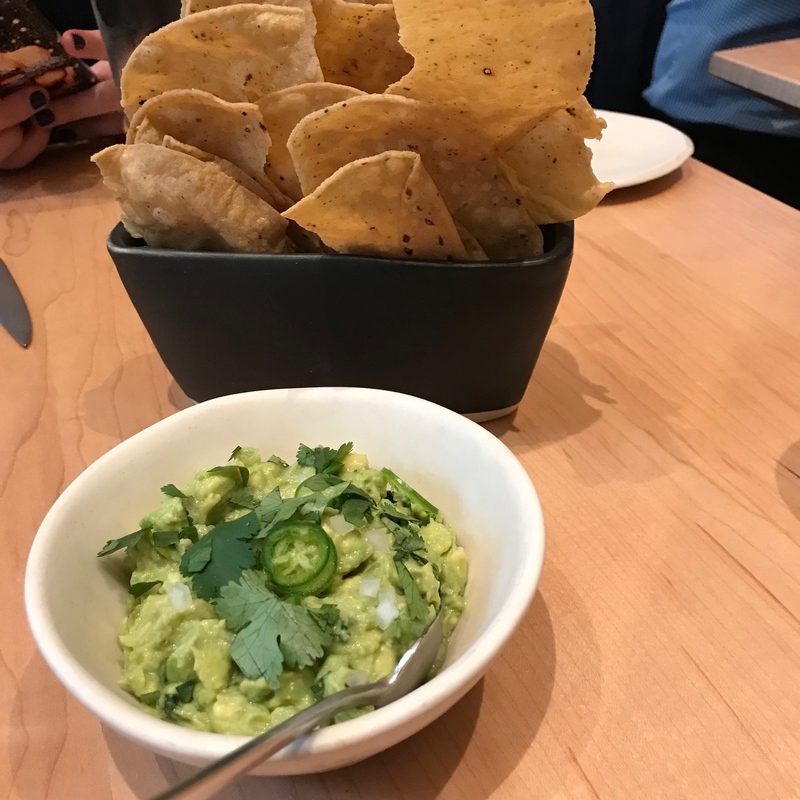 We started with the unimpressive, Chipotle takeout portion size of guacamole ($21). 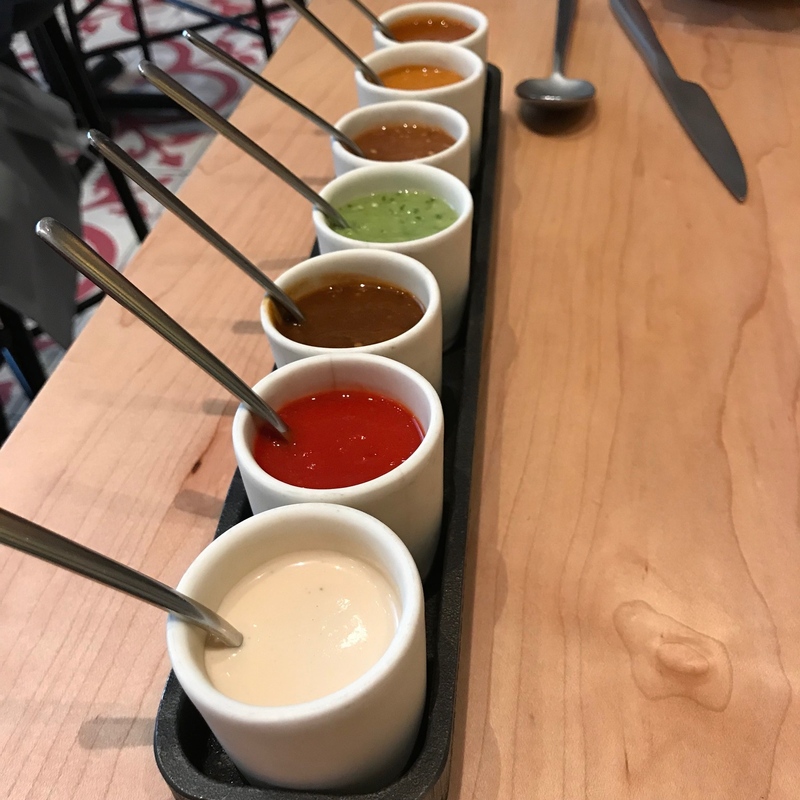 It was presented with brightly colored sauces arranged according to heat along with large salty, oily chips ($21). I would not reorder unless I had ingested numerous margaritas. 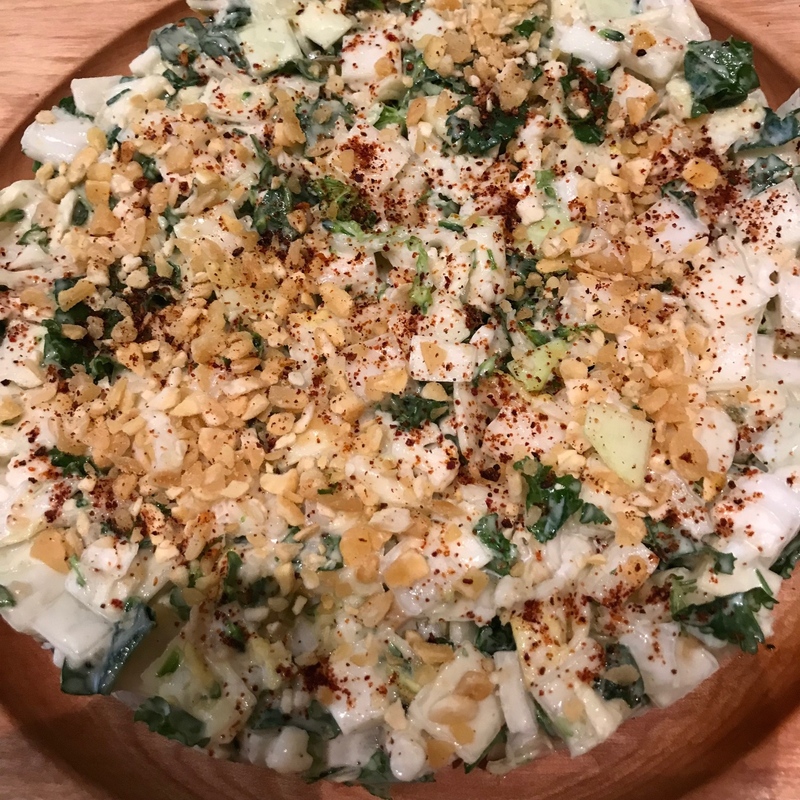 The Chopped Cabbage Salad with Toasted Fava Bean Dressing was a real highlight…crunchy and delicious ($17). We ordered Tacos to share. Each order includes 2 small corn tacos. I am not a fan of corn tacos and these were no exception. 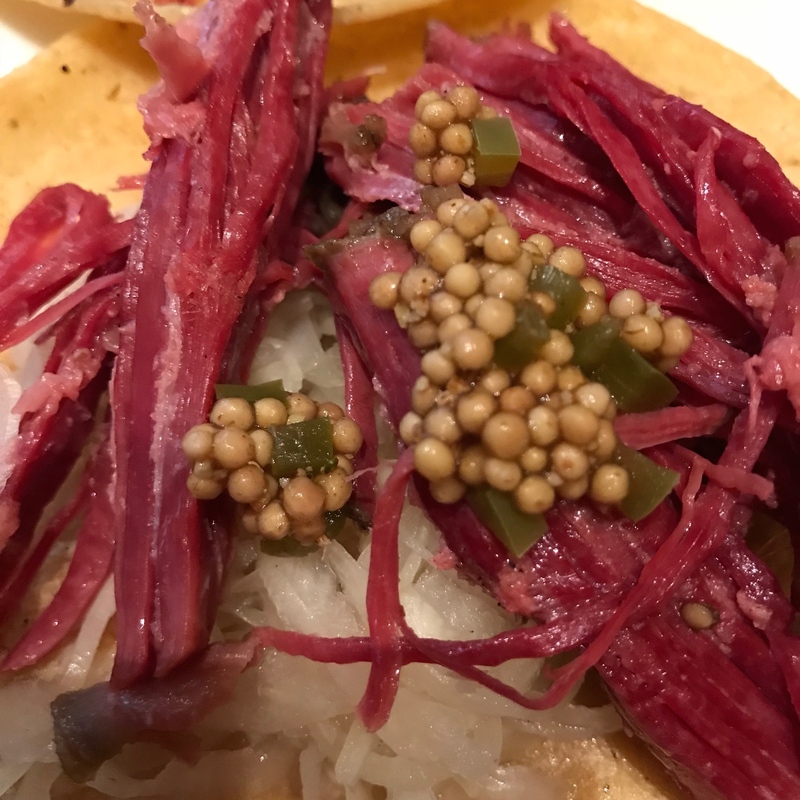 The Pastrami with Mustard Seed Salsa was tender and tasty so I picked out the meat and left the corn taco ($22). The Skirt Steak with Onions was the best of the two, but you can order this off a 6th Avenue Halal food truck and do as well for half the price ($20). The ultimate reason to visit Empellon are the desserts. Fortunately, we were generously gifted with an amazing treat. My reward for being honest and sympathetic earned me a fabulous sweet made by Chef/Owner. Alex Stupak, formerly the longtime pastry chef at Alinea and WD~50. 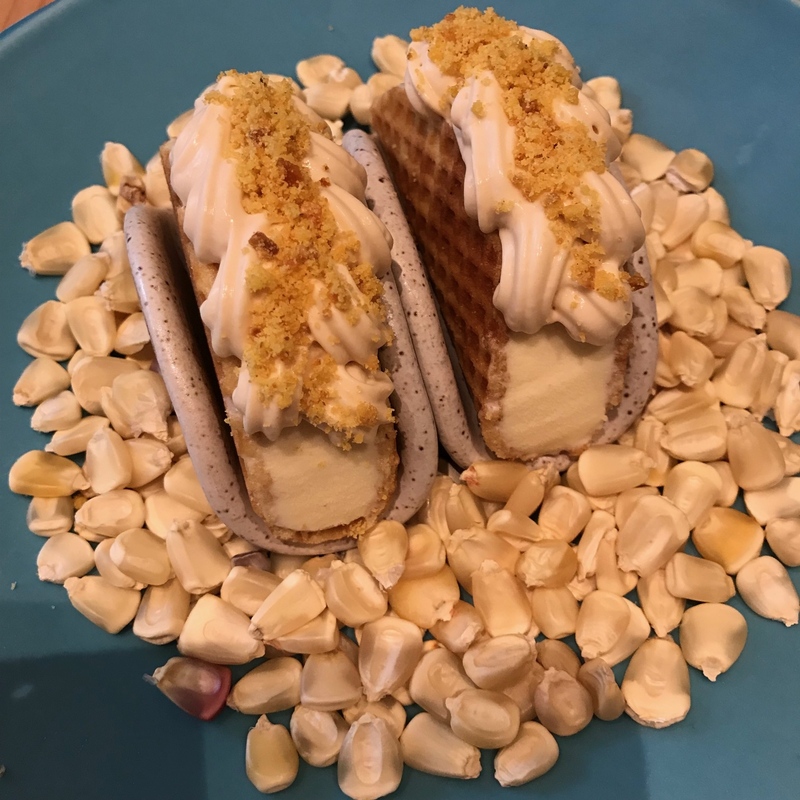 Our server, Gabriel, was so appreciative of my support that he sent over the outstanding creamy and flavorful Corn Ice Cream Tacos. Empellon is like the typical LA starlet…pretty, well turned out, but not much going on under the surface. Gabriel is an all-star so if you enjoy overpriced Mexican along with delicious desserts, sit with Gabriel and invite a self-impressed hedge fund geek to join you…his treat. Oh…expect to wait for your table. Empellon 510 Madison Avenue New York City. Open for Lunch Monday-Sunday 11:45am-3pm. Dinner nightly 5-10pm. Bar opens at 4pm daily. Reservations on OpenTable.com. you . crack . me . up .